Plastic products advertised as biodegradable have recently emerged, but they sound almost too good to be true. Scientists have now found out that, at least for now, consumers have good reason to doubt these claims. In a new study appearing in the ACS journal Environmental Science & Technology, plastics designed to degrade didn’t break down any faster than their more conventional counterparts. The research team from Michigan State University notes that to deal with the plastic waste problem, many countries and local governments have adopted laws, such as single-use bag bans, to deal with increasing amounts of trash. Most plastics end up in landfills, where they sit for decades or longer without breaking down. 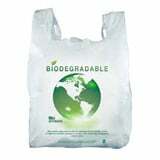 More recently, some manufacturers now make plastics with additives that are supposed to make the products biodegradable. But the effectiveness of this approach has been unclear. In this study, they evaluated the effect of biodegradation-promoting additives on the biodegradation of polyethylene (PE) and polyethylene terephthalate (PET). Biodegradation was evaluated in compost, anaerobic digestion, and soil burial environments. None of the five different additives tested significantly increased biodegradation in any of these environments. They team believes their findings could have wide-ranging implications for consumers, the environment and the companies that make these products.